As you’ve no doubt guessed by now, my personal political views fall somewhere to the left of Mikhail Bakunin. 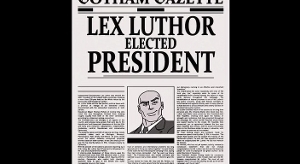 So, as you’d expect, I experienced quite the nerdgasam back in the year 2000 when (through a convoluted story line tonight’s film rightly jettisons without the slightest nod) Lex Luthor became President of the D.C. Universe’s United States. Finally, I said to no one in particular, given that at the time I had no friends, someone in comics understands the f-ed up mess we’re in. But all good things must come to an end, and since this is D.C. Comics, that “end” must engulf the entire world in some form of world-engulfing peril, preferably one stolen from the plot of a popular summer sci-fi/action movie. Because you can’t throw D.C.’s most insanely-powerful superheroes at just any-old idiotic inhabitant of the White House.